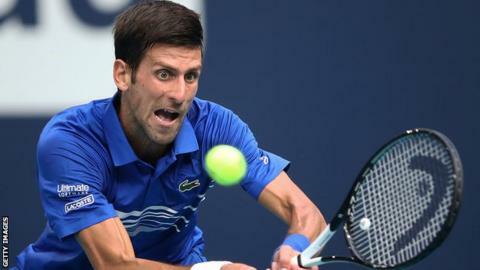 World number one Novak Djokovic blamed "wasted opportunities" after being beaten by Roberto Bautista Agut in the Miami Open fourth round. Djokovic, a six-time champion in Miami, also lost to Bautista Agut at the Qatar Open in January. British number one Kyle Edmund earlier reacted angrily to noise from the crowd during his loss to American John Isner. Edmund was trailing 5-3 in the second-set tie-break when the point was stopped after he heard a shout of "out" from the crowd. Umpire Carlos Bernardes ruled Edmund had lost the point as a result, with the Briton saying: "They keep shouting every point, I keep hearing it." Isner served an ace on the next point to wrap up a 7-6 (7-5) 7-6 (7-3) win. Despite claiming the first set of his match in 31 minutes and breaking in the first game of the second set, Djokovic ended up well beaten by Bautista Agut. The Spaniard said he made a decision to "play more aggressively" in the second set and he was leading 5-4 when rain delayed the match by 40 minutes. Djokovic held serve after the delay and had a break point to lead 6-5 but failed to convert. Bautista Agut saved eight of 10 break points in the final two sets and after the 22nd seed broke for a 4-2 lead in the final set, he held serve and converted his first match point to ensure victory. It is the first time Djokovic has lost in Miami after winning the first set - he previously had a 41-0 record. "He is a solid player but I shouldn't have lost, " Djokovic said. "I thought I played well and during this tournament but two or three sluggish games and that's what happens." Australia's Nick Kyrgios was given a point penalty for appearing to swear at a member of the crowd during his defeat by Borna Coric. Kyrgios, who was abused by a spectator in his third-round win over Dusan Lajovic, also smashed his racquet in the 4-6 6-3 6-2 defeat. He was given a warning for breaking the racquet - which he later gave to a crowd member - before being deducted a point for an audible obscenity. Kyrgios said: "I'm playing for two hours and 20 minutes, and a guy yells at me, like 'play some tennis'. "I'm not going to take it. When you're competing and in the heat of the moment, it's probably not what you want to hear. If I swear or something, then I'll lose the point. That's why I didn't argue it. I just walked to my chair." The 23-year-old also criticised umpire Gianluca Moscarella at a changeover, saying: "The entire match people were screaming out. You did not do one thing until I told you to do it. "Honest feedback, you've done a terrible job."